Purgatory Creek flows into the San Marcos River just south of the rapidly-growing central Texas City of San Marcos. The creek is part of an extensive series of watersheds and rivers located in the southern portion of Hays County, and it lies directly over the Edwards Aquifer Recharge Zone. The aquifer is a massive underground river, and a vital source of drinking water for Central Texans. Bounded by limestone outcrops, the creek's meander also supports open savannas and dense woodlands of oak, juniper, and mesquite, and provides critical habitat for the endangered golden-cheeked warbler, black-capped vireo, and many other rare and endemic species. 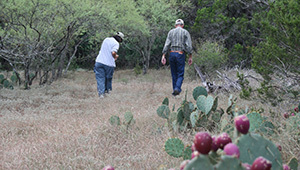 In 2003, the City of San Marcos acquired the 463-acre Purgatory Creek Natural Area (PCNA), a favorite destination for hikers and naturalists. Since then, over a series of projects, the Trust for Public Land has helped grow PCNA by over 500 acres, adding protected open space, and helping San Marcos create a continuous 1000-acre swath of open lands, crossed with miles of hiking trails for residents and visitors alike.